Where is everybody? Have vacations started already? Is there a black cloud over Lee’s Banquet Haus? Two weeks in a row of lousy attendance will now be followed by a Holiday with no meeting. Let’s see if we can get everyone back in their seats on June 1! Be there or be warned – we can always track you down and DRAG you in! Lottery Master Jim Robinson conducted this week’s drawing and awarded the small pot of $15 to the Kienzle table. Unfortunately, Valery Junge was not able to find the winning card for the BIG POT of $47 (Woo-hoo! ), but she was officially declared the Queen of Clubs (the card she drew). Larry Kienzle began his hunt for dollars by accepting the donation of the $15 lottery pot on behalf of the club. President Elect Bill Boone (who was running the meeting in Doug Fisher’s absence) was fined for misspeaking in regard to the induction of new members to be held shortly; Van Cardaras was fined for not remembering the difference between a “Pap Smear” and his “C-Pap”. We need to talk to Pam about this! Bob Lilly and Jake Hill were fined for being tardy (and John Smith isn’t late anymore, now that he retired!). Sgt. Larry also asked if anyone in attendance had not paid for their Pancake tickets, and Andy McGhee had to pay up for being tardy in that regard. Pres.Select Boone announced that there are currently 10 members who have not paid for their Pancake tickets! Please get this settled ASAP so we can finalize this event!!!! We received a wonderful thank you note from Tyler Wright, recipient of our Logan Rotary Club scholarship this year. Pres.Select Boone called Kathy Krumlauf to the front to handle the inductions of three new Rotarians: Paula Stewart, Clay Enslen and Julie Stuck. Paula Stewart is the Manage at Citizens Bank. She has been in Logan for several years, some at another financial institution, but she is happy to be at Citizens Bank now. She has two children and 5 grandchildren. Clay Enslen is the Administrator at Logan Health Care. He grew up in Pomeroy and is happy to be in the SE Ohio area again. He has three daughters (poor man!) and is looking forward to getting to know all of us. Julie Stuck is the CEO of Hocking Valley Comm. Hospital. She has been employed there in various capacities for over 18 years. She is married with 1 daughter, 2 step sons and 7 grandchildren. Her daughter is graduating from college this year – and she is planning a wedding for 6 weeks after graduation. I think Julie is going to be busy for a few more weeks before we can pull her into full immersion in Rotary activities! Welcome to the Club to you ALL! We look forward to working with you for a better community. Today’s program was presented by Minchon Vickers, Sanitarian with the Hocking County Health Department. Minchon is originally from China, but has been in the USA for over 21 years. She is married with 1 daughter (graduating on Saturday from high school). Minchon is the Food Safety specialist for the County Health Department. 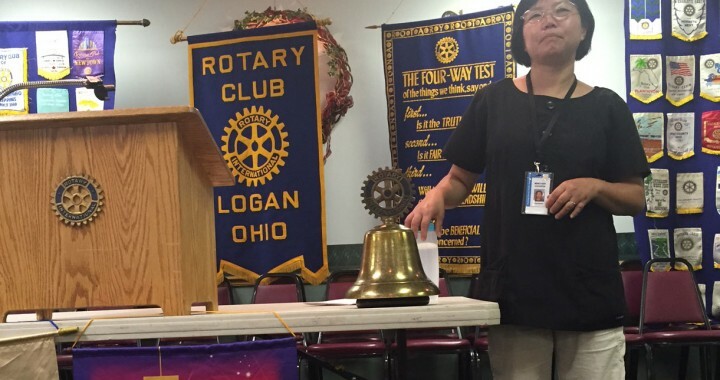 Based on recent events in Lancaster, Minchon spoke to us about botulism. Botulism is an anerobic bacteria – it only grows without oxygen, which is why it happens in home-canned foods so often. Exposure to botulism has a high fatality rate, especially is a person’s immune system is already compromised. It is odorless, colorless and tasteless. In addition, Minchon gave us information on several other possible bacterias that can be harmful if ingested. The bottom line – wash all produce thoroughly and don’t eat home canned food!!! Thanks for a wonderful program, Minchon! REMEMBER – No meeting for the Memorial Day Holiday!